This PDF 1.5 document has been generated by Microsoft® Publisher 2010, and has been sent on pdf-archive.com on 31/10/2016 at 16:57, from IP address 216.161.x.x. The current document download page has been viewed 176 times. File size: 23.6 MB (54 pages). manufacturing facilities found primarily in the Phoenix and Tucson areas. The “Five C’s” of Arizona’s economy are: Cattle, Copper, Citrus, Cotton and Climate. the largest copper producer in all of North America. The worlds largest solar telescope is located at Kitt Peak National Observatory in Sells, Arizona. arrived there in the middle of a storm and decided to move operations further west, to Hollywood. and establishing Hollywood as the movie capital of the world. Mount Lemmon, in Santa Catalina Mountains, is the southern most ski resort in the United States. Mountains States (Colorado, Idaho, Montana, Nevada, New Mexico, Utah and Wyoming). reputed to be the oldest continuously inhabited community in America. Commission staff with the assistance of Marshall Trimble, Arizona’s Official State Historian. to many Lenders offering a variety of loan programs to suit your particular needs. and then find out you can’t afford it. It shows you what the approximate down payment and closing costs will be. which may allow you to afford more home for your money. qualifications, co-mortgagor financing may be made available to you. It improves your negotiation position with the seller. It saves time once you’ve selected a home. The loan process is already underway. documents are deposited with the Escrow Officer until all obligations of the contract have been satisfied. 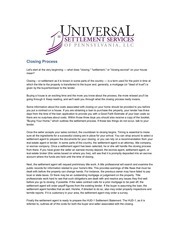 Upon satisfaction of all terms and conditions of the contract, the Escrow Officer will close the escrow. Escrow Officers act on mutual written instructions ONLY and do not represent either party to a transaction. Thus, they have a fiduciary responsibility to ALL parties to the contract. usually in the form of a personal check, made payable to the title company. escrow number and pertinent contact information known to us at the time. The Escrow Officer begins “working the file”. 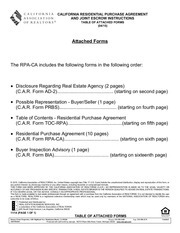 The Preliminary Title Report is order and received, and faxed to agents and lender. Escrow Officer schedules signing appointment with seller. The home owner’s association is notified and statements are ordered. Seller’s written mortgage loan payoffs are ordered. Buyer’s agent remits termite report to Escrow Officer. Buyer’s agent remits home warranty plan information. Lender’s loan terms and documents are requested. Buyer provides Escrow Officer with homeowner’s insurance information. The pre-audit HUD 1 settlement statement is faxed to agents and lender. Upon receipt of loan documents, Escrow Officer schedules signing appointment with buyer. received, the transaction can record. Close of escrow has taken place! Close of escrow, deeds are recorded! checks, and final closing packages are ready for pick up, delivery or mail. This file has been shared by a user of PDF Archive. Document ID: 00502015.